ith his father a career Air Force officer and his mother a dramatic arts major, both travel and creativity have influenced Roderick Smith's journey through life. He and his wife, Linda, live in Southeast Portland. "My work is a desperate attempt to grab hold of the moment and sew it into my garments before it is torn away." Roderick views painting as a type of performance art  the energy of its creation is found in the determination of every painted stroke. "Sometimes you lead the brush, other times it leads you," he said. "This is a constant dynamic that requires an intuitive response and the perfect balance is often illusive. "You are throwing yourself into a cauldron of mystery. This is the great leap of faith that brings you back again and again. It is a fiery furnace that drives itself in endless motion, giving energy and requiring the same." It is sometimes difficult for Roderick to know if he has gone deep enough into that cauldron or if he will find his way back out. "There are moments when in this strange convection you are set free and you rise above the morass of your endeavor and watch the creative spirit working outside yourself," he said. "It is indeed quite rare. You are riding in the slipstream of your own soul." Then there are the times when, sooner or later, Roderick overreaches in an effort to control and maintain  usually when the inspiration behind a painting vanishes. "Technique and effect try to save the day but the hand only gets heavier and the eye narrower, the vision begins to fade," he said. "One painting in particular crashed on its own reef. I froze up inside. I mourned its passing for 24 hours and sent the gallery a note to say it wouldn't be coming to the show." No sooner had Roderick sent the note than he felt set free. There was no longer anything to protect. He walked up to the painting and, with a wide brush, reshaped it within minutes. "I was awed by the transformation, as I always am," he said. "It's what I am looking for and never can remember how to find. The paintings in the studio now are sailing merrily along, but I know that danger lurks." 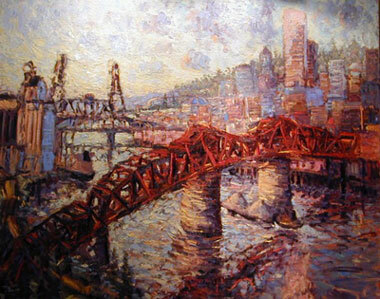 This month Roderick is showing at Portland's Broderick Gallery, 814 SW First Avenue. The show includes 30 oils drawn from his travels during the past two years to Southern California, Mexico and in the Northwest. "They are exuberant oils that celebrate the urban and natural world with a rhythmic energy that is emotionally and physically palpable," he said. In 1961 Roderick and his family sailed from Gibraltar to New York; he was 10 years old. His mother was pregnant and wanted her fourth child to be born in her Pennsylvania hometown. "I was in the glory of my childhood and that summer would become etched in my mind as a time of great joy and happiness," he said. "My grandmother's large and eclectic home was a bastion of romance and adventure." His grandmother loved Shakespeare and could recite entire plays. She had been a summer playhouse theater producer and director; the forest in the back yard was the natural backdrop for a stage where actors played their parts. By that summer the stage had long been abandoned and Roderick's grandmother had moved on to the painting arts. "My bedroom was her enchanted studio," he said. "Here I first laid eyes on the tools and artifacts of a real painter. "Still-life objects of everything imaginable were strewn on tables and stacked on shelves. Canvases were piled against the walls; some finished, some just begun. Vases holding brushes, jars filled with odd liquids, books everywhere. Bonnard, Cézanne, Braque, Matisse and Robert Henri's 'The Art Spirit,' the very first book on art I can ever remember reading." 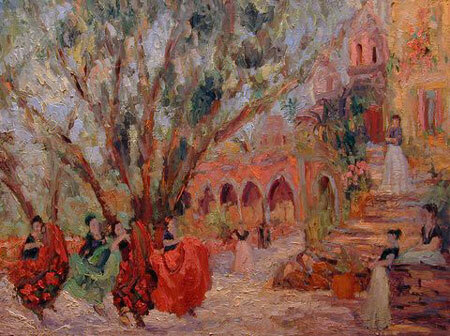 Returning to Spain in the fall, Roderick's mother gave him his first oil painting set. He was thrilled and made copies of very old, small Spanish works his mother found in the back street markets of Seville. "We traveled extensively and she kept the art game alive by appointing me 'expedition artist,'" he said. "I took my drawing seriously and, from Toledo to Lisbon to Lucerne, I dutifully sketched the fountains and castles along the way." In 1973 Roderick graduated with his BFA from Rochester Institute of Technology and worked in commercial design for three years. In 1977 he journeyed to Alaska. "I'd been inspired by the artist and illustrator, Rockwell Kent," he said. "My mother had given me a signed copy of the lavishly illustrated book 'Wilderness in Alaska,' the story of a man and his son on a lonely island working as artists while embracing the unknown together. I was hooked and ended up going to Alaska every summer for the next five years, working on fishing boats." This afforded Roderick the opportunity to travel during winters, until 1980 when he returned to New York to continue his studies at the Art Students League. "The floodgates suddenly opened," he said. "I was studio-painting mornings and nights and roaming the galleries of the Metropolitan Museum every afternoon." 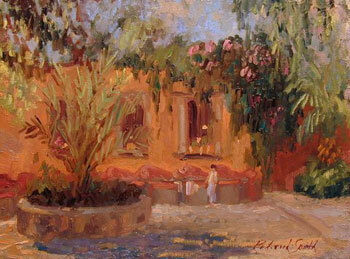 He spent the following winter studying drawing and painting at the Instituto Allende in San Miguel de Allende, Mexico. In 1981 Roderick moved to Portland and settled down with his wife, doll artist Linda Miller. It wasn't long before they had a thriving doll company called Cadena Studios. For the next 10 years dolls consumed Roderick's creative energy. Along the way a curious fascination with marionettes appeared. "I found that I could make dolls move and thereby create 'serious' theater," he said. "This opened many new doors." It wasn't until 1994, at an art festival in Miami Beach, that his interest in painting would reignite. In seven days he did 148 charcoal drawings of people on the boardwalk. "My hands were ablaze. It came out of nowhere. I returned to Portland distracted and convinced that yet another page had turned," he said. "I buried myself in drawing the human form. "Drawing gave way to painting and in 1999 I had my first one-man show in charcoal and watercolor that featured dancers and musicians and circus performers all done from 'live' sketches." The following year he continued the theme in oil with a show entitled Stage Plays. He had now moved from static dolls, to moving puppets, to two-dimensional worlds of characters from theater and the performing arts. "The fire burned brightly but the heat nearly consumed me. By the spring of 2000 the muse had vanished," he said. "It's often been said that the root of art lies in nature. I was tired of the circus, fatigued by chasing psychological dramas on canvas." Wanting to be set free, yet seemingly trapped, Roderick found himself in an art store in front of a stack of watercolor paper. He bought the lot while thinking to himself, "I'm going to destroy these sheets one by one and I'm going to do it in the natural world where only the weather and the light will guide my hand." And he did. "The landscape became a kind of chapel," he said. "I found myself in a call-and-response with nature. I found a dance partner. I set up a rickety easel and stood behind it and let myself go. Charcoal lines flying over the motif. Watercolor creating form. "I was drawing again but now it was more like drawing water from the well. The charcoal stick became a magic ladle, opening a whole new way to explore the world around me. I could take from the motif and not feel obligated to put it back the way I found it. It was a revelation." Roderick was reinspired. 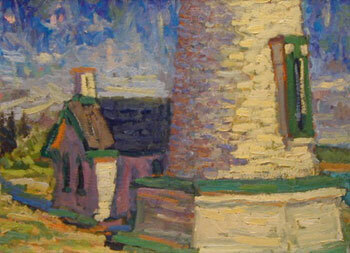 He gathered his paints and journeyed forth into the world of plein air painting. For the next four years he plied the landscape with oil paint, through all the seasons, in all manner of weather. One painting after another. Some would reveal the lucidity of the moment, others would explode into chaos. 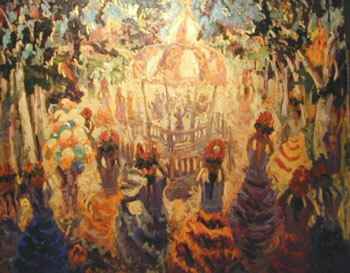 "The ghosts of Pissarro and Monet jostled with the Fauves for the balance of light and emotion. Abstraction was kept at bay by a strong need to dance with the seen world. I was held captive by the play between the known subject and the raw data from the painted stroke that created it," he said. "It reminded me of the puppet theater. In one moment I could see a tree and in the next the wild fusion of tangled brush strokes that created it  up close an abstract suggestion and as you move away a picture emerges. This created a perpetual animation and I found that paintings could resonate with captured energy." On a hot day in L.A.'s Griffith Park, Roderick hauled an 18"x36" canvas up a trail in an attempt to capture the sunset. He had worked the composition for hours in preparation for the advancing light but was dismayed to find he'd lost his way. "I just stood there, not knowing where to go as the sun turned orange and the shadows glazed into that deep violet blue," he said. "Eventually, an Italian man strolled up the trail and caught me at the crux of the painting, that point where what you have established comes in conflict with that which you had hoped for. He told me of a painting he had just purchased with what little extra money he had as a struggling actor: a small old California painting of a sunset with trees and yellows and oranges. It wasn't that well done; in fact, the canvas had been stitched together to create a panel large enough to paint on, and on the back was a painting of a woman. He identified with the struggling artist in the artifact of this old canvas, so he bought it." Looking at Roderick's painting reminded the stranger of an acting class lesson where his teacher gave the advice: "When you learn a part, learn everything, believe everything, feel everything, see everything and when you come to the stage be prepared to throw it all away, tear up the script, enter naked." "He told me I was stagestruck," Roderick said. "I was trapped in my own knowledge that was fearful of letting what I had worked so hard for go, and so that I had fallen into a trap. "He left and I stepped back to the canvas with nothing to lose and everything to gain." 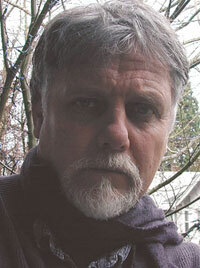 E-mail Roderick at lantern@europa.com and visit his Web site. You can reach Kathy at kanderson138@comcast.net, and draw on other Sketch Pads.